Overlapping coverage of multiple radio access technologies provides new multiple degrees of freedom for tuning the fairness-throughput tradeoff in heterogeneous communication systems through proper resource allocation. This paper treats the problem of resource allocation in terms of optimum air interface and cell selection in cellular multi-air interface scenarios. We find a close to optimum allocation for a given set of voice users with minimum QoS requirements and a set of best-effort users which guarantees service for the voice users and maximizes the sum utility of the best-effort users. Our model applies to arbitrary heterogeneous scenarios where the air interfaces belong to the class of interference limited systems like UMTS or to a class with orthogonal resource assignment such as TDMA-based GSM or WLAN. We present a convex formulation of the problem and by using structural properties thereof deduce two algorithms for static and dynamic scenarios, respectively. Both procedures rely on simple information exchange protocols and can be operated in a completely decentralized way. The performance of the dynamic algorithm is then evaluated for a heterogeneous UMTS/GSM scenario showing high-performance gains in comparison to standard load-balancing solutions. In today's wireless scenarios, new radio access technologies (RATs) are emerging at frequent intervals. Although operators quickly introduce new wireless systems to the market they still have a strong interest in exploiting their legacy systems. Consequently, scenarios where an operator is in charge of multiple air interfaces with overlapping coverage are a common business case. Dense urban environments in Europe, where users are often in the coverage of a cellular TDMA-based GSM and CDMA-based UMTS systems, serve as a good example. In this case, if services are offered independently of the radio access technology and terminals support multiple wireless standards, the operator has the freedom to assign users to a cell and air interface of its choice. Over the last years there has been growing interest in academics and industry in which way these degrees of freedom should be used and how users should be assigned in heterogeneous wireless scenarios to exploit resources more efficiently, incorporate fairness, and increase reliability. Established concepts include load-balancing, service-based, and cost-based strategies. Load-balancing strategies assign users such that overload situations are avoided in one RAT as long as there are resources left in a collocated radio system . More advanced approaches are service-based strategies which select an RAT also in dependence of the requested service type . These strategies exploit the fact that one wireless technology might be better suited to support a certain service-class than another one due to different granularities of distributable resources, different coding, and modulation schemes. However, both approaches neglect the fact that also the position and corresponding channel gain of a user influence the efficiency of an RAT supporting a service request. Reasons include different carrier frequencies and corresponding channel models of RATs, base station positioning, different interference situations and sensitivity to it. A concept that considers all earlier mentioned factors, like the system load, service class, interference situation, characteristics of the RAT, and users' positions, is the cost-based approach, introduced and analyzed in [3, 4]. There, it was observed that all characteristics can be bundled together in one cost parameter per user and RAT which suffice to calculate a close to optimum assignment that maximizes the total number of supportable voice users under static conditions. Alternative approaches can be found in  and references therein. In this paper, we analyze in which way users of different service classes should be assigned in a heterogeneous scenario, thereby extending ideas from [3, 4]. Users request either a fixed minimum data rate, for example, as needed for voice services, or unconstrained best-effort (BE) data services. We formulate the user assignment as a utility maximization problem which is constrained by the resources (such as power or bandwidth) of the individual base stations (BSs) as well as users' minimum data rate requirements. The utilities represent quality of service (QoS) indicators of the BE users and, by choosing appropriate utility functions, give operators the freedom to tune the operation point of the heterogeneous system. It is important to note that although our model holds for general concave utility functions we will adopt the concept of -proportional fairness introduced in  which allows to variably shift the operation point between maximum sum throughput, proportional fairness up to max-min fairness by a single, parameterizable utility function. Related work on utility maximization in nonheterogeneous interference limited systems was carried out in [7–9], where the generally nonconvex utility maximization problem was turned into a convex representation (or supermodular game) using specific techniques. The major difference to the approach taken in this paper is that we consider a heterogeneous scenario where the user-wise utilities are a function of the individual link rates; this practical assumption significantly complicates the analysis and neither of the approaches in [7–9] can be applied. Based on the convex formulation and by using structural properties, we present a decentralized algorithm that solves the optimization problem for static scenarios and derive simple assignment rules using the dual representation of the utility problem. The insights gained from the static setup are then adapted to dynamic scenarios and we design a distributed protocol which requires minimal information exchange between users and BSs and still achieves considerable performance gains. Most importantly, both algorithms allow operators to arbitrarily tune the fairness-throughput tradeoff online without any system changes. Although we cannot guarantee the convergence of the simplified algorithm in the dynamic scenario we observe a close to the global optimum operation in case a sufficient number of users requests service and the variation of the channel gains due to mobility is low. This is verified by the derivation of an upper bound and comparison to simulation results. Still, also for low service request rates and stronger channel variations due to mobility and fading considerable gains in terms of throughput and sum utility are obtained in comparison to a load-balancing strategy. The paper is organized as follows: after the introduction of the system model and the utility concept in Section 2, we will formulate the optimization problem in Section 3. Algorithms that solve the problem in a decentralized way for static and dynamic scenarios are presented in Section 4. There, also the upper performance bound for the dynamic scenario is derived. In Section 5, we eventually evaluate the performance of the dynamic algorithm by comparing it to a load-balancing approach. We conclude the paper in Section 6. In this work bold symbols denote vectors or matrices, calligraphic letters sets, and the cardinality of a set. The transpose of a vector is , is the m th element of and is the expectation. The summation over sets is defined as . We consider a wireless scenario in the down-link direction where multiple RATs with partly overlapping coverage are arranged in an area called playground. The set of RATs thereby consists of two subsets: in RATs with orthogonal resources time or frequency slots or subcarriers are assigned explicitly and users connected to one BS do not interfere with each other. In interference limited RATs all users share the same bandwidth and the power constitutes the distributable resource. Each RAT consists of a set of base stations and one operator is assumed to control the set of all base stations . 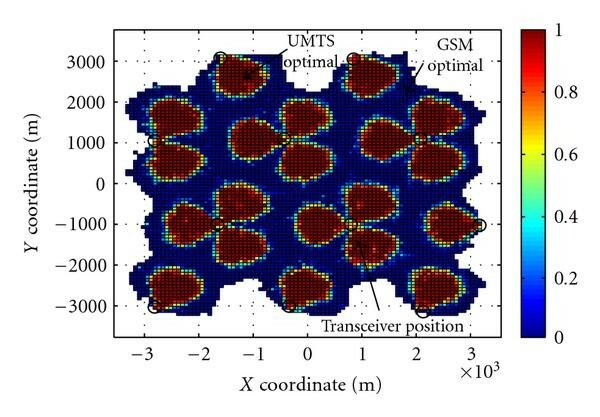 An exemplary scenario with one cellular UMTS system belonging to the interference limited class and one cellular GSM/EDGE air interface of the orthogonal class is depicted in Figure 1. Playground with 40 GSM and 40 UMTS directional transceivers (collocated). Since commercial wireless systems usually operate on individual frequency bands, we assume that signals of different RATs are orthogonal to each other and no intersystem interference takes place. Users can be affected by intra- and intercell interference within one radio technology, however. The set of users can be divided into two subsets and users are equally distributed on the playground; users request a voice service with guaranteed data rate and have priority to BE users who do not have any QoS guarantees. Furthermore, it is assumed that the user equipment is able to cope with all RATs and the service requests are independent of the technology giving the operator the freedom to choose a cell and a RAT for each user that is best suited from its perspective. Next we will describe the two classes of RATs that are covered in our scenario in more detail. The approximation in (9) represents the first order Taylor expansion for if one chooses . Clearly, this approximation holds only for low data rates and since we are interested in a good approximation for typical rates of the UMTS system, it turns out to be practical to use a higher slope . Indeed we plotted the rates in (9) over for UMTS in Figure 2 and chose so that it intersects the real rate curve at the origin and which covers the range of rates that are typically assigned to users in UMTS in our scenario quite well. Obviously, this is only a model, but works fine for the problem at hand. We refer also to the discussion in Section 5. UMTS resource-rate mapping: quality of linear approximation (9). which is a convex polytope as for the orthogonal RAT. Our approach stands in clear contrast to  where a convex feasible rate region for interference limited RATs was obtained with the posynomial transform and assuming . The posinomial approach has the advantage that also the BS sum transmission power can be optimized. However, the corresponding rate approximation is only valid for high SINR and does not hold in our scenario. The linear structure of our approximation will further lead to simple assignment rules in Section 3.
holds . The parameter in (14) hereby tunes the fairness-throughput tradeoff; for the system throughput will be maximized, which might result in assignments where only very few users are served and which is quite unfair. A selection leads to proportional fairness which is equivalent to assigning equal shares of resources to all users in our scenario. For the assignment converges to the max-min fairness, where all users will be assigned equal data rates and the overall system throughput will be low . Note that the definition of the utility in terms of the sum of a user's link rates in (13) is more relevant for practical application than, for example, the sum utilities of individual links used in [7, 9]. It turns out that it is exactly this so-called nonseparable utility formulation that leads to the desired characteristic that most users will establish only a single link, as will be shown in Section 3. By contrast, the separable utility in [7, 9] will favor multilink operation and therefore the results cannot be applied to our model. This follows from the concavity of and the Jensen's inequality; assume a user is assigned a certain sum rate that can be split between two links and , . Then, it is beneficial in terms of the separable sum utility to activate both links because . Here denotes the variables at the optimum. maximizes the inner problem and solves (17). In this case, the rate assignment is unique and only depends on . In (30), is the inverse of the derivative of the utility function with . Equation (30) gives some valuable insights to the optimum cell/RAT selection of users and the corresponding resource assignment. First, it can be shown that almost all users are assigned to exactly one BS since in general. Second, this BS can be determined independently by each user if is known and under the assumption that each user can measure . Both characteristics rely on the linear connection between the data rate and the assigned resources and on the user based utilities and greatly simplify the distributed solution of (P1). In contrast, one would obtain that under the high SINR assumption in [7, 9], which implies that all users have active connections to all BSs in the interference limited air interface. Third, the maximum slope of the utility function defines a threshold which can be tuned to switch off BE users with low , as will be described in Section 5.
where the last equation is obtained by adding and subtracting the terms to and the assumption that . Further, it can be shown from (32) that the vector , with is a subgradient. A descriptive explanation of the subgradient approach is as follows: for a given the rate assignment might either violate the feasible rate region constraint or will not exploit all available resources. Both cannot be optimal since the first case is not feasible and in the latter case the assignment of more resources to any BE user would increase the sum utility. Then, the subgradient gives the direction how should be updated so that the resource constraints are less violated or more resources are assigned. At the global optimum of (P1), all entries of the subgradient will be zero and all resource constraints are met with equality. The subgradient will be used in the decentralized algorithm, which will be presented in Section 4. We will now present two decentralized algorithms for (P1) in a static and dynamic scenario, respectively. In the static setup, all user requests and channel gains are assumed to be fixed, while in the dynamic one the requests and user mobility are subject to stochastic processes. The static algorithm hereby serves as motivation for the dynamic one which is adapted for practical applications with the advantage of requiring almost no signaling information. Based on the optimality conditions of the inner problem and the subgradient of the outer loop in Section 3, we are able to formulate the static Algorithm 1, where denotes the index of the iteration, is the step size, and a constant for the stopping criteria. The algorithm consists of an iterative procedure where in each cycle at first all BSs broadcast the BS weights to all users. Then, each user evaluates for all BSs and sends an assignment request (and the corresponding or ) to a BS . Next, each BS individually calculates the rate assignment for all users that sent an assignment request to it. The rate assignment hereby depends on and might lie either inside, on, or outside the feasible rate region of BS and thereby either under exploit, meet with equality or violate the resource constraint. Correspondingly, BS will update using the subgradient and the cycle starts again by broadcasting the updated BS weight. Although Algorithm 1 might not converge to the optimum rate assignment in case and therefore results in , we can formulate the following theorem. Algorithm 1: Decentralized utility maximization. (1) Each BS initializes . (2) Each BS broadcasts to all users.
. If it picks one BS of the set randomly. sum utility and that fulfills the voice user's rate constraints corresponding to (30). updates its dual weight . (6) Assign users to with corresponding to (3), (4). which is independent of the actual BS selection of the users. Therefore, Algorithm 1 will converge to the optimum and to the maximum utility also if . The optimum rate assignment of users that are in multilink operation results then from by solving the set of KKT conditions which reduce to (33) since for any nontrivial solution. In a dynamic scenario where users and service requests follow stochastic mobility and traffic models, respectively, applying Algorithm 1 might be a good choice from a theoretic perspective. Practically, however, the procedure is too expensive, since, having the optimum user assignment at any point in time, it would have to be executed any time a user's channel gain or interference situation changes (and therefore ) and in case a service request arrives or leaves the system. Each execution thereby might trigger reassignments of a whole set of users and a considerable amount of signaling information would have to be exchanged between users and BSs in each iteration. (It is noted here that higher utilities might be obtainable in the dynamic scenario by exploitation of mobility information or, e.g., under the fluid assumptions .) We therefore suggest the following adaptation of Algorithm 1 to a dynamic procedure which can be split into two almost independently operating parts, the cell/RAT selection of users and the resource assignment inside each BS. A user's heterogeneous cell/RAT selection procedure is described in Algorithm 2(a). It is similar to the one in the static setup; the BSs broadcast and each user selects a BS . However, unlike in Algorithm 1 where all users directly update their cell/RAT selection if is updated the selection is only triggered once at the beginning of a service request or if the user would be dropped from the air interface where it is currently assigned to. For the selection, only local information ( can be measured or estimated for all BSs by a user) and the BS weights are needed similar to the static procedure. After a user selected a cell/RAT or in case that the request, the channel or the interference situation changed, an update of the resource assignment will be triggered in the corresponding base station. Thereby, the triggers are independent for each BS and no information from neighboring cells is needed for the resource assignment. Also, contrary to the static Algorithm 1, the resource update will not trigger the cell/RAT selection of users and users stay assigned to their current BS in general. Only in case a user cannot be supported by a BS anymore and no intrasystem hand-over is possible the user will execute Algorithm 2(a) again leading to a possible intersystem hand-over. The resource assignment in a cell will be updated following the iterative procedure in Algorithm 2(b). Algorithm 2(b) maximizes the sum utility of the BS over all BE users that are assigned to it and assures that all voice users comply with their minimum rate requirement. Thereby, the rates will be assigned in a way that all available resources are exploited and that the resource constraint of the BS is met with equality before is broadcasted again. This stands in clear contrast to the static algorithm where is updated based on the subgradient. (a) Cell/RAT Selection of user . (2) Based on the broadcasted user evaluates with (27) and sends an assignment request to . (b) Resource Assignment of BS . Since in Algorithm 2 each user only actively selects a RAT/cell once at its call setup and it does not trigger reassignments of other users in general almost no signaling information has to be exchanged between users and BSs. The simplicity of Algorithm 2 however, comes at the cost of its optimality. The influence of new users on , mobility, and the restriction that users stay in the actual air interface if possible lead to situations where a user might find itself assigned to a BS . Wrong assignments will lead to deviations of and it cannot be guaranteed that the procedure approaches to , which would be the optimum weights for the current request and channel situation in the static scenario. Since Algorithm 1 is difficult to implement in our simulation tool, we will derive a simple upper bound. The bound allows us to evaluate the maximum degradation of an assignment obtained with the dynamic procedure from the optimum solution of (P1). Since the bound overestimates (P1), it is also an upper bound for Algorithm 1 and could be used to evaluate the quality of the static Algorithm 1, which might be nonoptimal in case . with . Only the rates are needed for the evaluation of the bound which can be easily calculated by (30). In this section, the performance of Algorithm 2 will be evaluated by comparing it to a load-balancing algorithm. We therefore employ Alcatel-Lucent's C++ based MRRM-Simulator which is an event driven simulation environment for heterogeneous wireless scenarios. It supports cellular UMTS/HSDPA, GSM/EDGE air interfaces, a WiMAX hot-spot, and different service classes such as VoIP, streaming, circuit-switched voice and best-effort data services. For the simulations we consider a 2-RAT scenario consisting of a cellular GSM/EDGE and UMTS air interface with 42 BSs each. The BSs of both RATs are arranged as indicated in Figure 1; on each site there are 3 BSs with directional antennas of both RATs collocated with the distance between sites being 2400 m. All RAT specific parameters are listed in Table 1. Equally distributed inside the rectangular movement area (see Figure 1), there are users that are moving corresponding to the pedestrian mobility model in  with and randomly requesting services based on a Poisson process with exponentially distributed service duration with a mean of . For voice services a constant data rate of is required while no minimum requirements for best-effort services exist. The shifting operation leads to a finite slope of the curve at the origin which is essential to enable switching off users. Otherwise, a user in a deep fade might be assigned almost all resources, if . In the simulation scenario, there are in average voice service call setup requests per second inside the movement area which corresponds to approximately active voice users and a voice traffic load of per cell area in average. Additionally, a varying number of BE users request service. For the simulation statistics, only the investigated cells (see Figure 1) are considered. 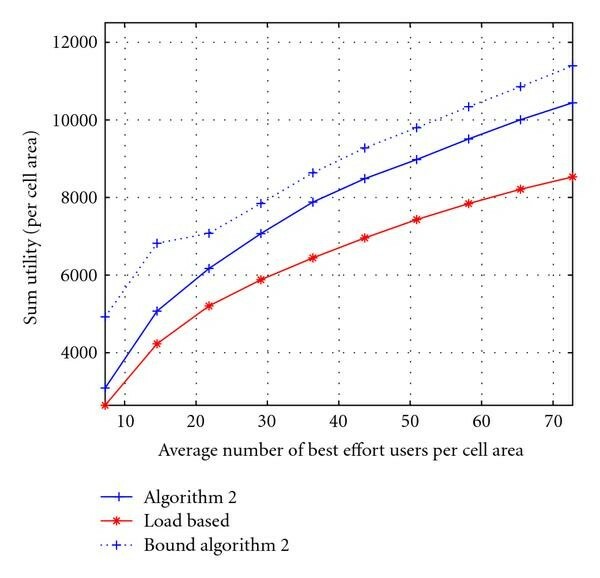 In Figure 3, the throughput of the BE users based on the real SINR-rate mapping and the approximation is shown over the average number of active BE users. As can be observed, Algorithm 2 achieves up to 30% more throughput compared to load-balancing. The real and approximated rates match pretty well in the region for low user request rates, but also at high load the deviation is small compared to the gain. The sum utility per cell area and the upper bound are shown in Figure 4. The utility gain of Algorithm 2 compared to load-balancing is also almost as large as of the throughput because of the low curvature of . The distance to the bound is of special interest; at high call arrival rates the distance is almost zero, indicating that Algorithm 2 performs close to optimum and no significant gains could be achieved by using Algorithm 1 instead. At lower rates this is different. Here, the dynamic procedure pays the price for its simplicity in terms of performance loss. The main reason for the loss results from the fluctuation of . At low request rates a user's call setup or service termination has a great impact on the resource allocation of the other users in the cell and therefore leads to strong variations of over time. The fluctuation of directly influences the set of optimum BSs of users and therefore often leads to the case that users find themselves assigned to a currently nonoptimal BS. In this case, the dynamic algorithm looses performance since the cell selection is only allowed once per user in general. Higher utility values could be obtained here by allowing users to perform intersystem hand-overs so that each user would be assigned to again. This characteristic is also reflected in the looseness of the bound. 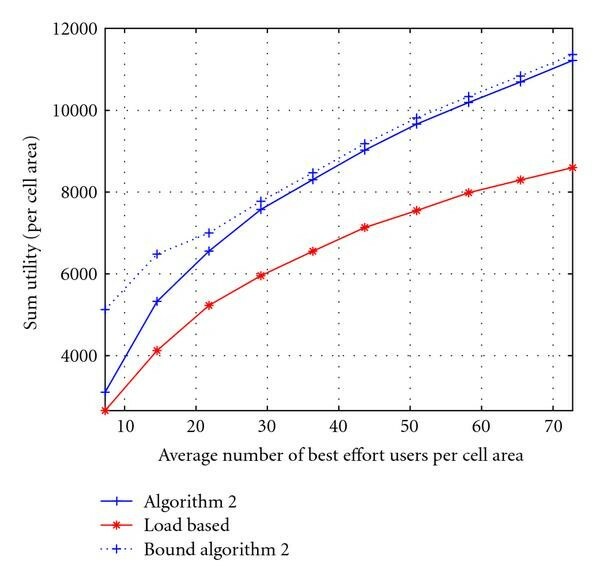 Unlike to low request rates, if the average number of users in a cell is high the influence of a single-user arrival or departure from a cell on is diminishing and a user's optimum BS hardly changes during the service time. In this case the performance is almost optimal and the bound gets very tight. The tightness also indicates that the influence of the users pedestrian mobility and therefore the variation of (and on ) is negligible in this scenario. BE throughput with and without linear approximation (9) without slow fading. Sum utility and upper bound without slow fading. For the heterogeneous UMTS GSM/EDGE system the following interpretation of the optimum assignment strategy can be given. One observes that is a monotonically increasing function of a user's SINR for both air interfaces. Therefore, for a given the optimum cell/RAT selection reduces to an SINR threshold. This threshold depends on the air interface and the service type through and on which can be interpreted as the load situation of the BS. 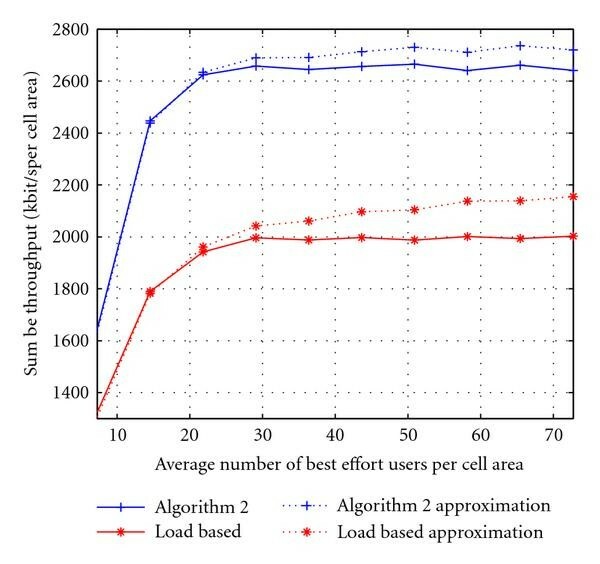 The threshold characteristic can be observed in Figure 5, where the BE user assignment in terms of the selected RAT is shown by color shades; Algorithm 2 assigns users to UMTS that are in the red area close to the BSs and users in the blue area to GSM. The border of both areas is characterized by the threshold SINR of each RAT which has a lobe pattern because of the directional antenna characteristics. The pattern looks very regular in Figure 5 due to equal average loads in each cell of an air interface (and therefore equal for BSs of one RAT) and collocated sites of UMTS and GSM BSs. 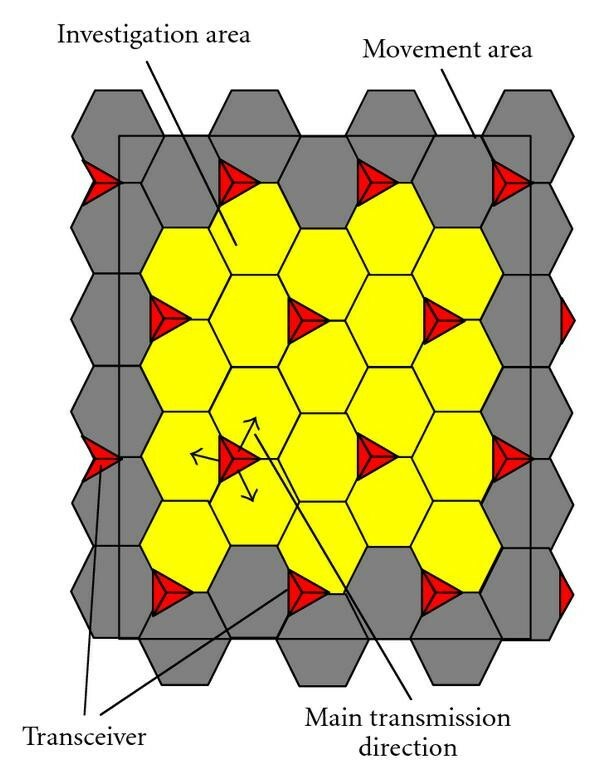 However, Algorithm 2 will also flexibly adapt itself to the optimum configuration in case of arbitrary, not necessary collocated, BS positioning and varying load situations without any change in configuration of the algorithm. The optimum area pattern will then of course look different. Contrary to the BE users Algorithm 2 will assign almost all voice users to UMTS in the presented scenario. This is due to the fact that time-slot sharing is not possible in GSM for voice users. Therefore, the maximum slot rate of a voice user is much lower than in UMTS. Thus, a much lower of the GSM BS compared to the of the UMTS BS would be required to make GSM attractive for an assignment. This instance might suggest that also the major part of the gain of Algorithm 2 is based on the low effectivity of voice in GSM, which is not avoided in load balancing. Simulations however show that also for pure BE traffic gains of more than 20% are obtained. RAT assignment of BE users without slow fading: assigned to UMTS assigned to GSM. So far slow fading has not been active in the simulations to demonstrate that the utility bound can be tight and to visualize the assignment policy of Algorithm 2 qualitatively. 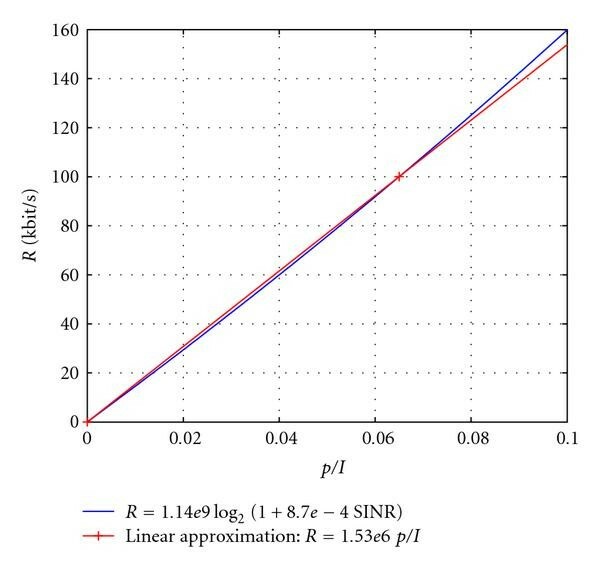 In Figure 6, the sum utility and the bound is shown for the scenario above however this time with slow fading corresponding to  in both air interfaces with a variance of . Considering load balancing, the slow fading does hardly influence the performance. For Algorithm 2 however the users' mobility in connection with the slow fading has a nonnegligible impact. Now, even small changes in position can result in large channel gain and therefore differences which lead to more wrongly assigned users and looseness of the bound. Nevertheless, still a gain of approximately 20% is achieved. Similarly the performance of Algorithm 2 decreases and the bound gets less tight without slow fading in case the velocity is increased. For completeness, it is noted here that in case users do not change their position the tightness of the bound under slow fading is similar to Figure 4. The observations made in Section 3 and in the simulations open up the way for even more simplified algorithms that might be interesting for practical applications. For given scenarios fixed base station weights or service dependent SINR, channel or even distance thresholds could be applied for the cell/RAT selection or as triggers for intersystem hand-overs. Additionally, in case users are subject to strong channel variations, for example, by mobility or fading during a service request updating the cell/RAT selection and therefore executing Algorithm 2(a) at more frequent intervals is an option to improve the performance and get close to the optimum again. In this paper, we developed an optimization framework for wireless heterogeneous multicell scenarios. Having derived the feasible rate regions for air interfaces with orthogonal resource assignment and a convex approximation for interference limited radio access technologies we introduced a convex utility maximization problem formulation for heterogeneous scenarios. We gained general insights on the problem solution and derived simple assignment rules that lead to the global optimum by exploiting the dual problem formulation. These observations were then used to develop decentralized algorithms for static scenarios and then simplified for dynamic settings. Although the simplifications came at the cost of the optimality still high gains in comparison to a simple load-balancing algorithm were obtained and close to optimum performance could be shown by simulations based on a duality bound. The authors are supported in part by the Bundesministerium für Bildung und Forschung (BMBF) under Grant FK 01 BU 566.